Hey guys, I am still here, still doing it, still creating! Let me say, this is even more rewarding that I ever thought it would be! I am so glad I started this project. One of the things that I really enjoy is writing these descriptions. When I had the idea of this project, I didn't realize that my comments would be such an important part of it! Thanks for all your feedback on these. 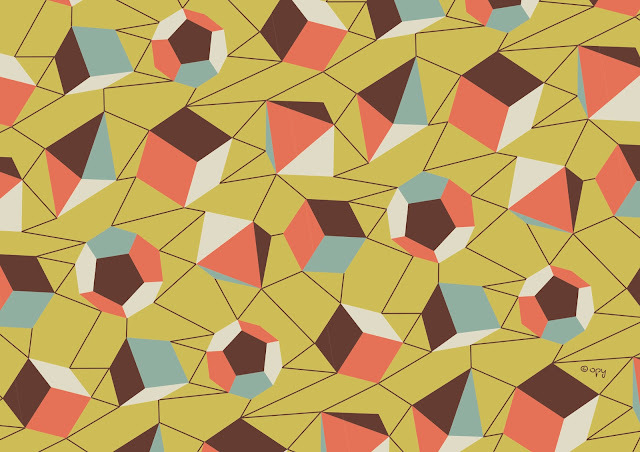 With this week pattern I wanted to take a break from the hand drawn elements. For a time now, I wanted to do something with polyhedrons, I believe there is something really cool on these 3D geometric solid forms, with its flat faces and straight edges, so I hope you like it, I know I do! This pattern is just divine. I can envisage it printed on a gorgeous silk scarf! Your work is truly creative; I also really liked the Xmas trees and the birds patterns.